Thank you so much Maurice for all the great Music, you guys are the best. Verdine, and Philip for their great performances all the time. Thank you! Thank you! Where is Fred White now? Do you know? Maurice White was my idol and my hero in life. Anticipation is all the way up,as I await,this memoir, Maurice’s reach across the seas,to a small island nation,in the seventies will forever be a treasure,to me.Thanks and always rest in love,power and peace. Today when listening to “THE GREATEST MUSICAL GROUP IN THE HISTORY OF MUSIC”, I cry! That’s because I grew up during the seventies , and the first time I heard them was when I was at a club as a teenager and “WHERE HAVE ALL THE FLOWERS GONE”” was played. I approached the DJ and asked who was that. I was blessed to see them live in New York City when they worked with the magician, who’s name I can’t remember at this time, and YES, the show & their performance was magical. “I LOVE EARTH WIND AND FIRE” , and each and every band member and section. I love everything about them , and will do so until the day I leave this life. They touched my spirit through their spirituality which was a component of their music and life. I am still in mourning for the huge loss of Maurice White. However, I am sure he is in heaven playing the most Beautiful music the angels have ever heard. Thank You EARTH WIND AND FIRE & TO You Maurice White. You were my first love. I’m so blessed to have your love and friendship. Your last words to me. I REMEMBER! I just saw the concert Earth Wind &Fire with Chicago last night in Calgary ,Alberta Canada! Wow This concert was one of the best I have ever seen in my life! The music was the bomb! The musicians, drummers, trumpeters singers and guitarist were the best ever.The light show fabulous , the song selection touching and beautiful , what an uplifting evening,what extraordinary musicians that played their hearts out with feeling and spirit! I’m originally from Montreal and went to McGill University. I was part of a Sorority- one Fraternity played the Semptember song at every party- it was a make the party song. The enter Saddledome crowd at the show in Calgary was up dancing !!! and Chicago songs from 70 s and 80 s. Chicago your songs bring memories of peaceful time with meaningful lyrics beautiful words and melodies. Thank YOU Earth Wind &Fire , Thank YOU Chicago for a beautiful evening with uplifting music and a spectacular visuals. I am fortunate to have witness your iconic music and you brought joy to my being!!! Wishing you well on the rest of your tour. Thank you for coming to Canada! My girlfriend and I were at the show in Montréal last october and we were stunned by your energy and your beautiful music. You are universal and belong to history. You are now part of our Soul. Growing up a little military girl born in the early 60’s traveling the world with my siblings and parents, it seems music was the only constant in my life beside my family. It was always there to soothe me. The tempo touched my heart, the beat moved my feet, the rhythm stirred my soul, but the words….once you put those words on top of all of that, in the way that only Earth, Wind and Fire can…. *GASP*…it was electricfying! You became my world! And with the release of “Reasons” I became a woman knowing who I was meant to be (not sexually, inwardly). Your music touched me in MANY ways! Ya’ll Funktified me, helped me grow up, taught me about my own emotions, and helped me to release the stress of the world. And you’re STILL DOING IT! The momiors by Maurice White through this book will be part of my curriculum as an educator. The music has always inspired me, but the books by Phillip and Maurice give me pride and provide human context for the EWF experience. Earth, Wind & Fire is unmatched as a band! The composition, vocals and instrumemtal arrangements are out of this world! All because of the genius of Maurice White. Kudos must also be given to Verdine, Phillip, Ralph and the others who made up the band over the years. I have seen the band perform live nine times! I hope to make it 10 very soon. My son CJ has one of Ralph’s drumsticks; hopefully, he will get another one to match at the next concert we attend. May Maurice rest in eternal peace! Surely, the music of Earth, Wind & Fire shall be an eternal source of love and healing. EWF forever! This book is really worth reading. It brings light (!) to so many aspects – meaning of lyrics, business context, musicianship – and yes, the racial divide which bizarrely conditioned a band whose message was: love y’all. And it tells the story of a man who made his dream come true, and sparked so many people’s imagination through talent and the strongest willpower. And yes, he truly believed in the Creator and man’s possibility to change life. This memoir will change yours. My 9th grader has recently begun dancing around the house singing September while she gets ready for school in the morning. Yeah, we couldn’t believe it either. Thank you! Hooray! My son CJ got his second drumstick from Ralph Johnson at the concert in Columbia, SC, on Friday, March 24, 2017. He received his first seven years ago when he was six years old. Now he is 13 and has attended three EWF concerts. Thanks Ralph! He now has a pair of your drumsticks that he will cherish forever. I have now attended 10 EWF concerts. Last Friday’s concert was one of the best ever. However, I really do miss Maurice. He was the genius behind it all. Thanks to Phillip, Verdine, Ralph and others for keeping the legacy alive. If I never attend another EWF concert, I can say that I have seen the best band ever for 10 live performances. Only thing left is to meet you guys personally. It would be a dream come true. The sound of EWF will always be in my heart and mind. Love and peace forever! Born in 1964 I grew up with your special music. Still listening to it every day! It is fabulous! You are all great! Best wishes and thanks for decades of fantastic music to the entire crew, greetings from Germany!! I’ve just finished reading this wonderful book, masterpiece and from Now On will be my music Bible, Thanks Maurice For Your Endless Legacy. I have learned as a musician a great lesson of leadership, musicianship and order in my music life. As a human being i have learned a lot more of humility and sensibility on the things around. How the media really worked and still work and to see things in a better way. When i first started to read until i finished it i can tell you that i’d smile, laugh and also cry sometimes of joy but other times of sadness. 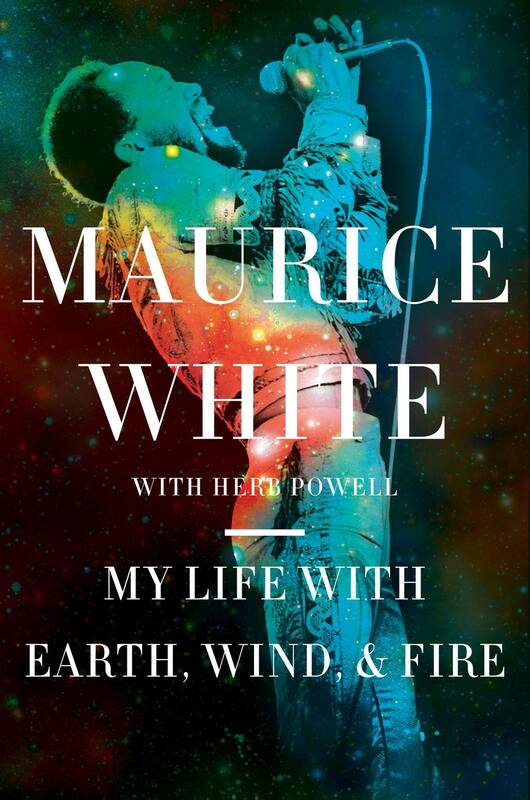 I’ve been a fan and follower of Earth Wind And Fire since my teen years and also as a musician, but reading Maurice life through this beautiful book everything has changed in every aspect of my life. Tell you that while i was finishing a chapter to continue later i was telling my wife everything i learned and discovered, lots of time laughing and others with tears in my eyes and barely talk in complete words. I never met Maurice in person even on a concert or show, which it’s very sad, but with my from-now-on- Music Bible i’ll keep that special part of a Man that really knew how to carry ahead a dream and a reality. Musically i’m changed and my music work too, humanly i feel deep inside another way to fit and fix things thanks to Maurice teaching. performing, you will always have me as a fan. Love you always. October 1979, the St. Paul Civic Center. Me and 3 friends had stayed up all night 2 months earlier to get 3rd roe tickets . High School kids…playing only vinyl in those days. Maurice, Philip , Verdine, Johnny Graham,, Ralph, Larry Dunn, Al McKay, Andrew Woolfolk and friends appeared through the illusions of Doug Henning. We sang every word to every song. And for a few hours the world stood still. Those of us who still crank it up I the car understand how unique the sum of the parts were. Maurice lives on through his music and always will. way one band could be this good. The guitars, rhythm and lead, perfect, the percussions, the horns, the back ground instruments all in perfect alignment. After reading the back of the album cover and finding the genius behind the sound was Maurice White, I at that moment became a true fan for life. This music truly transcends the test of time, Spiritual in message, funky in beat. This music is, and always will be a part of my life. I remember, one day my daughter was feeling the pressures of life, and she was down in the dumps, not knowing how to reassure her that everything would be alright, I downloaded the song,HEADS TO THE SKY, and text it to her. After listening to it, she text me back and said, I think ill keep this song. Damn right you will……….That’s EARTH WIND AND FIRE. Wow! I have never been so energized, filled with such great joy and love after attending a concert. Earth, Wind and Fire did it to me. First of all being there to listen to music legends perform songs that has been a part of my life’s chapters. Impeccable vocals and music that speaks to the soul. I understand why EWF has been around so long and so successful. We as a people need to listen to real musical instruments, played by gifted, talented and experienced musicians sets the bar for me. I am indeed on a happy cloud today after being in the their presence. Thank you God for blessing the world with Earth, Wind and Fire and their journey. As a lie-long EW&F enthusiast, I can say that at this point in my life (58), I can play anything from this library of amazing treatises and be immediately transported back to the days of ole and still feel the power of the syncopated rhythms that touched and moved my soul in the ’70’s and 80’s. This, in my humble opinion was, is and will always be the best group of musicians, singers and song-writers of all time! Maurice White and Charles Stephney created a most unique sound that will perpetuate through the annals of time to create an entirely new group of appreciative followers that will continue the dream and vision of the Master! Trumpet player. Seen him informally at NAMM a few years ago. Words fall short when I think of Earth Wind and Fire, in fact the mere thought makes me introspective of my life and of the world I live in. … the sounds come out from my computer, the genius, the greatness of the band fills the room … something hugs me inside and I know you’re here, love is still here ! … thank you Maurice for all the gifts that you gave us. I attended last nights concert 6/5/18 at the NJPAC it’s was unbelievable . What an experience , the talent that flows through this band is breathtaking . I will never forget that moment and thrilled I was able to attend . My souls always feels cleansed when I hear his voice . Continue to Rest In Peace . The best soul band ever, even decade after decade the music is incomparable, see them couple of times live. Faces was for me the top of their existence, but still going strong. Never had the posibility to see Maurice White live, but his musical heritage goes on for ever. Thanks for being born in your musical episode! Keep on ‘Runnin’! I saw you at Kaaboo this September in Del Mar. So so so fantastic. I rejoiced and sang and danced. My only tears shed were for my dear friend who was with me when I saw you perform in a Providence, Rhode Island in I think 1977, He is no longer on this plain, but when he was we spent many fine hours singing, talking, laughing and dancing to you. I loved him and I love you. Thank you!